Cool case. Those are always fun. I had a patient who came in with simliar symptoms (no camera though) and she had a peach pit stuck in her TI. She didn't have crohns but it was still fun. That's crazy that you bring this case up. I recently discharged a patient that was admitted for a PSBO. She had undergone upper and lower endoscopy. The GI had her undergo a capsule endoscopy. The photos showed severe crohn's. Unfortunetly the capsule was stuck in the terminal ileum. We NG tube decompressed her. She was in no distress so we waited about four more days for it to pass (it was in her for a total of 17 days). The GI guy did a colonoscopy on the fourth day. 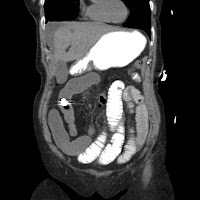 When he pushed into the terminal ileum and blew air in there the capsule popped into the cecum and was removed. The patient dodged a laparoscope. I have to say that i am not a fan of using the capsule endoscopy in patients with possible crohn's, especially if you feel the disease is active and alot of inflammation is going on. Went home two days after the colonoscopy. Her small bowel opened right up after the capsule was removed. I thought about having the GI repeating the scope but she was more tender than you like to see. Plus, I figured that if it was stuck, there must be pathology (stricture/cancer/etc). I suspect your patient is going to need surgery sooner than you think. Nice post.. it works perfectly to make my point on a previous post of mine... "I guess it's better than swallowing a rock"
I loved watching the video my doctor created from the capsule endoscopy I had. I guess I was lucky my capsule. left my system 2 hours before I was sapose to go back to the doctors to drop off the belt. I had my Pill Capule Endoscopy on Wednesday... Still inside me & feeling all sorts of nausea/pain.... But since I've had unexplained severe abdominal pain since August 2009, I'll give it til Monday to notify my GI Dr if it's still "stuck." :) I'm hoping for some answers from this proceedure!! !